Writing Paragraphs A distinct division of written or printed matter that begins on a new, usually indented line, consists of one or more sentences, and. 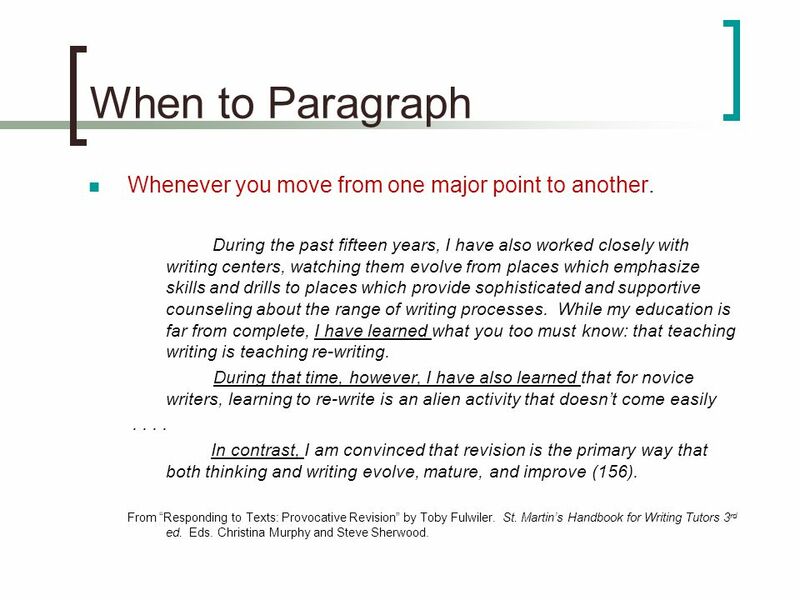 3 When to Paragraph Whenever you move from one major point to another. During the past fifteen years, I have also worked closely with writing centers, watching them evolve from places which emphasize skills and drills to places which provide sophisticated and supportive counseling about the range of writing processes. While my education is far from complete, I have learned what you too must know: that teaching writing is teaching re-writing. During that time, however, I have also learned that for novice writers, learning to re-write is an alien activity that doesn’t come easily.... In contrast, I am convinced that revision is the primary way that both thinking and writing evolve, mature, and improve (156). From “Responding to Texts: Provocative Revision” by Toby Fulwiler. St. Martin’s Handbook for Writing Tutors 3 rd ed. Eds. Christina Murphy and Steve Sherwood. 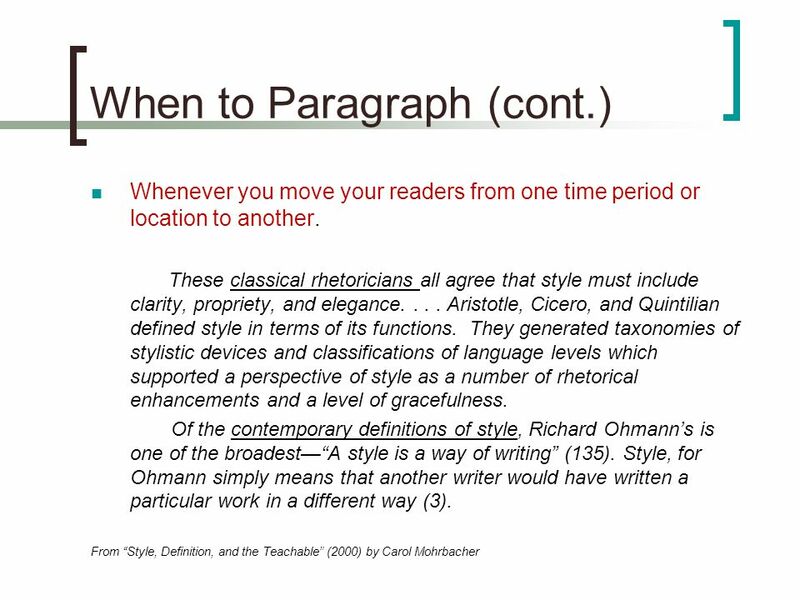 5 When to Paragraph (cont.) Whenever you introduce a new step in a process or sequence. First she asked herself, “Is there a problem?” Her visit to Earl Grey only confirmed to her that the client had a problem that needed to be solved.... Second, she began answering the question, “What is the problem?” The RFP seemed to be suggestiong that Earl grey needed more office space.... Finally, she began thinking about what kind of proposal she would need to write. It seemed as though the people at Earl Grey had a pretty good grasp of their problem (25). 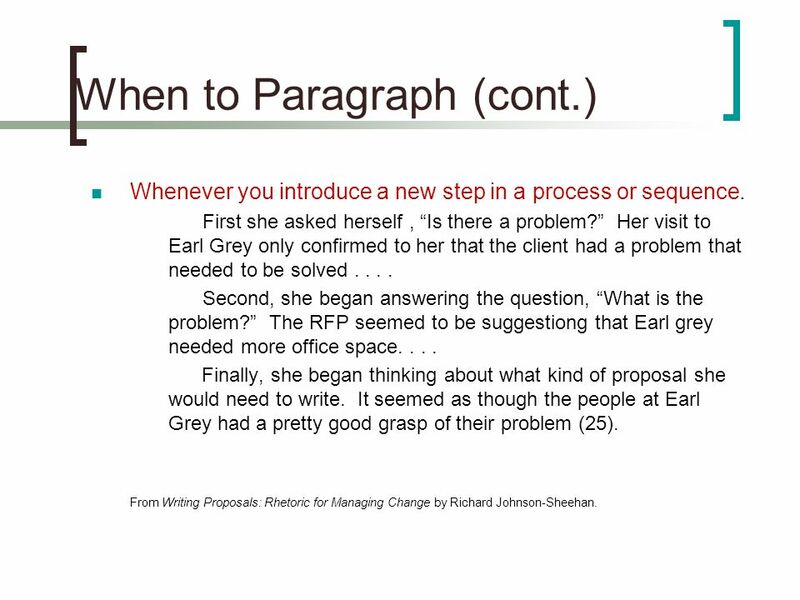 From Writing Proposals: Rhetoric for Managing Change by Richard Johnson-Sheehan. 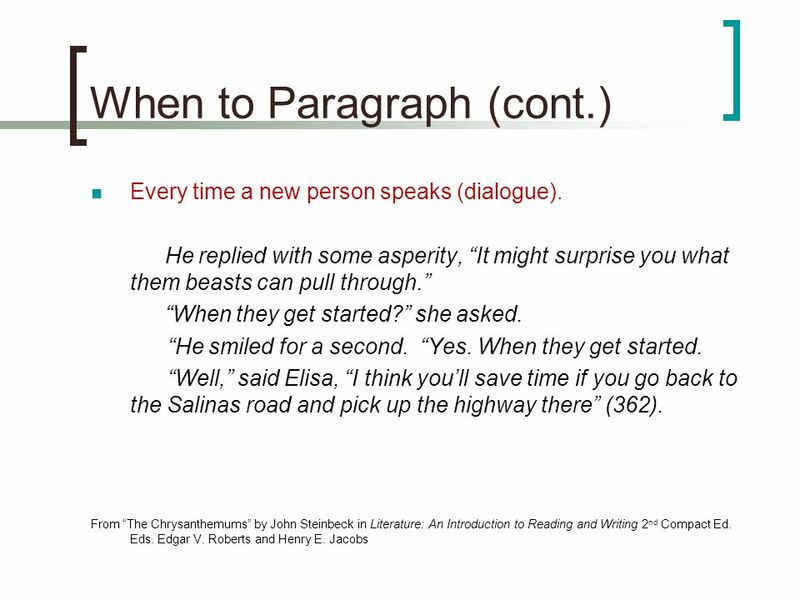 8 When to Paragraph (cont.) 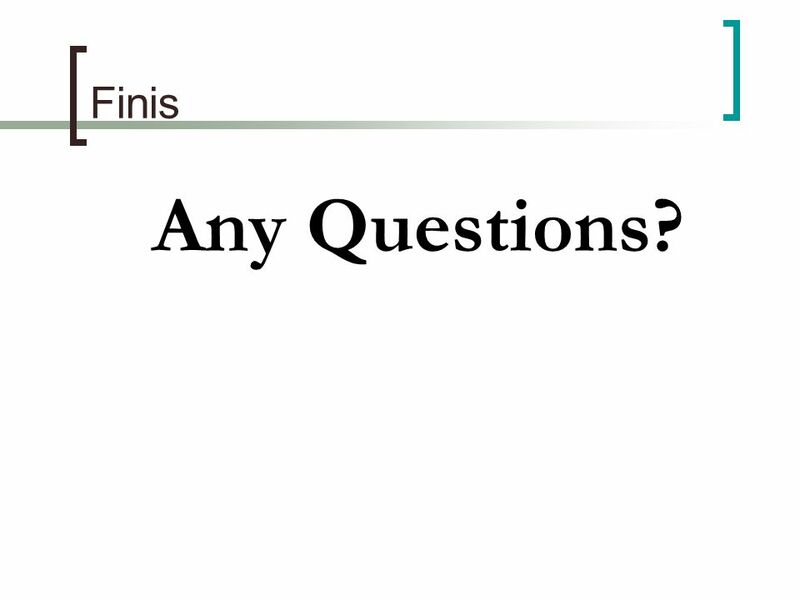 To signal the end of your introduction and the beginning of your conclusion. Also, if it is as important to Sally as she says it is to establish a rapport with writers, did she do enough to call attention to what Portia did right in her essay?.... Did Sally recognize these qualities in Portia’s writing or was Sally blinded to them because she felt defensive and threatened? 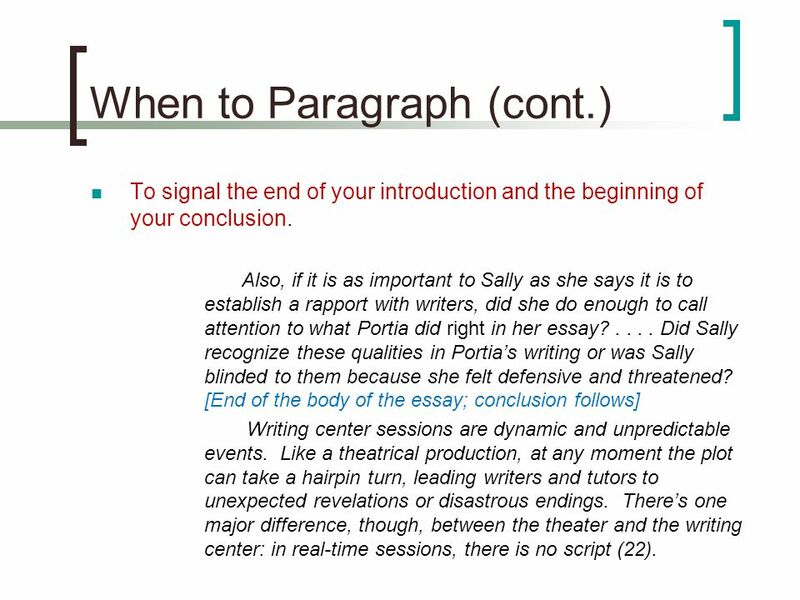 [End of the body of the essay; conclusion follows] Writing center sessions are dynamic and unpredictable events. Like a theatrical production, at any moment the plot can take a hairpin turn, leading writers and tutors to unexpected revelations or disastrous endings. There’s one major difference, though, between the theater and the writing center: in real-time sessions, there is no script (22). From A Tutor’s Guide: Helping Writers One to One 2 nd Ed. by editor Ben Rafoth. 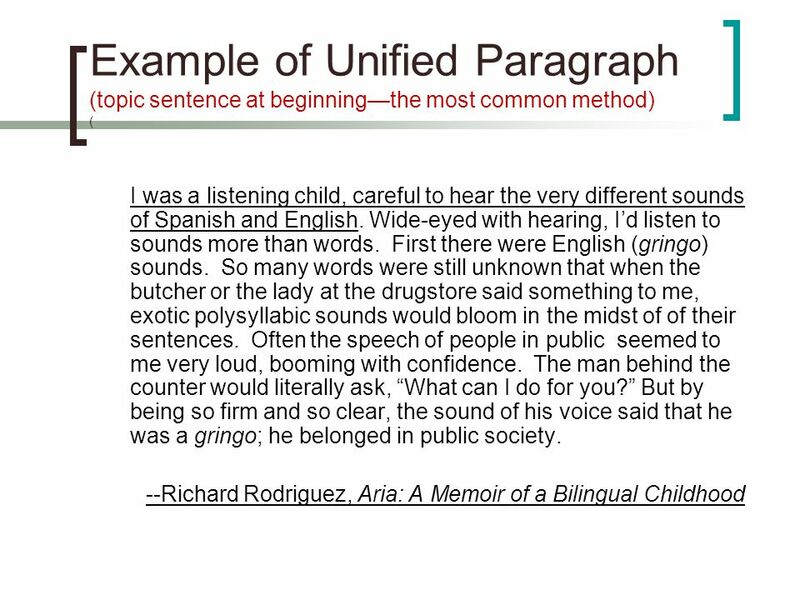 9 How to Unify Paragraphs Develop a single idea. 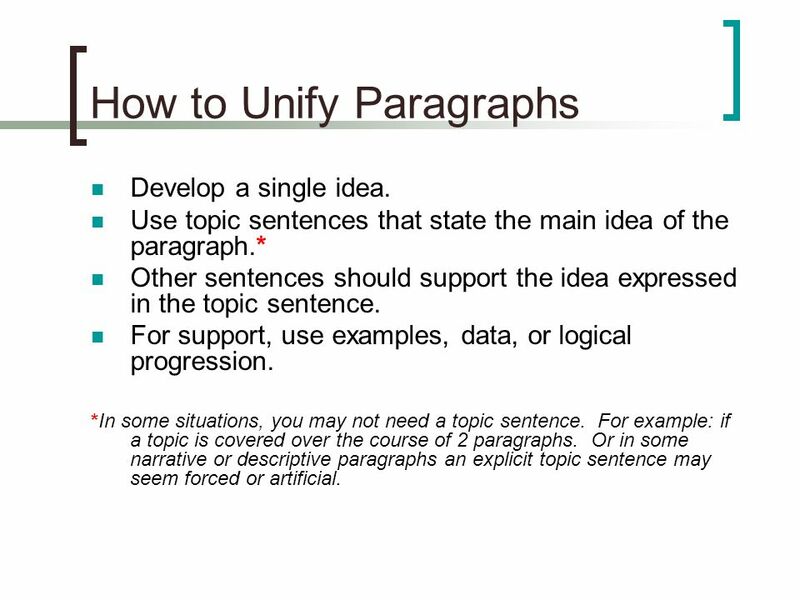 Use topic sentences that state the main idea of the paragraph. 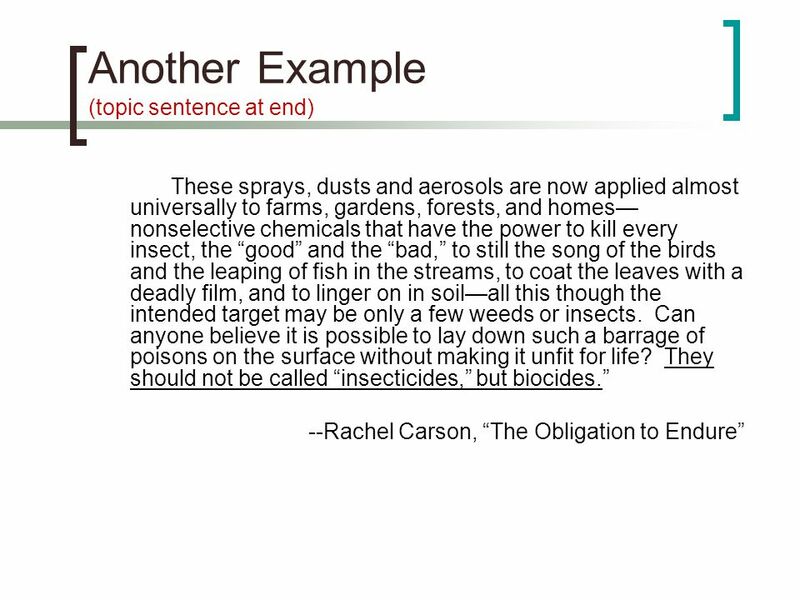 * Other sentences should support the idea expressed in the topic sentence. For support, use examples, data, or logical progression. 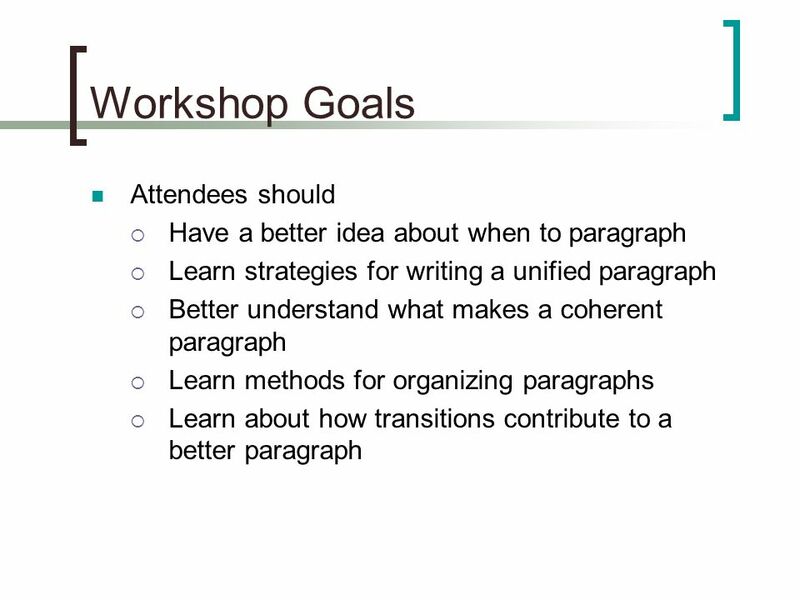 *In some situations, you may not need a topic sentence. 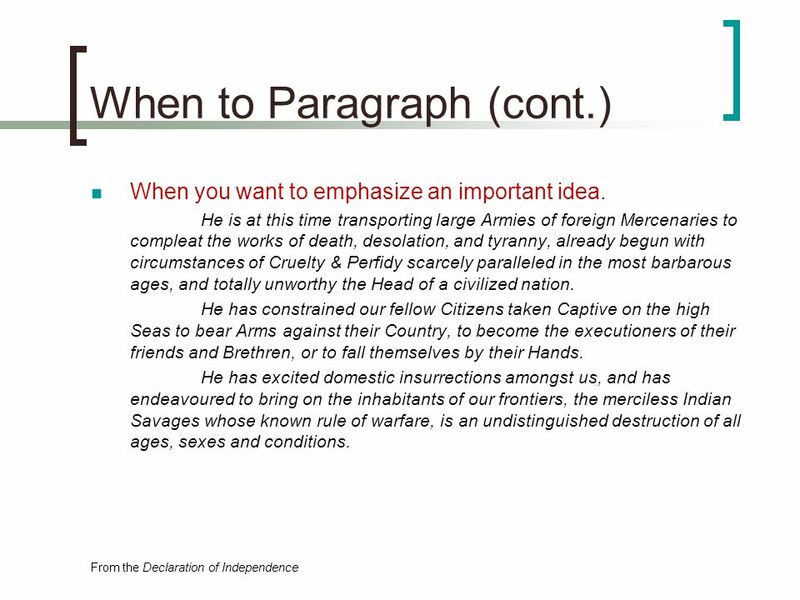 For example: if a topic is covered over the course of 2 paragraphs. 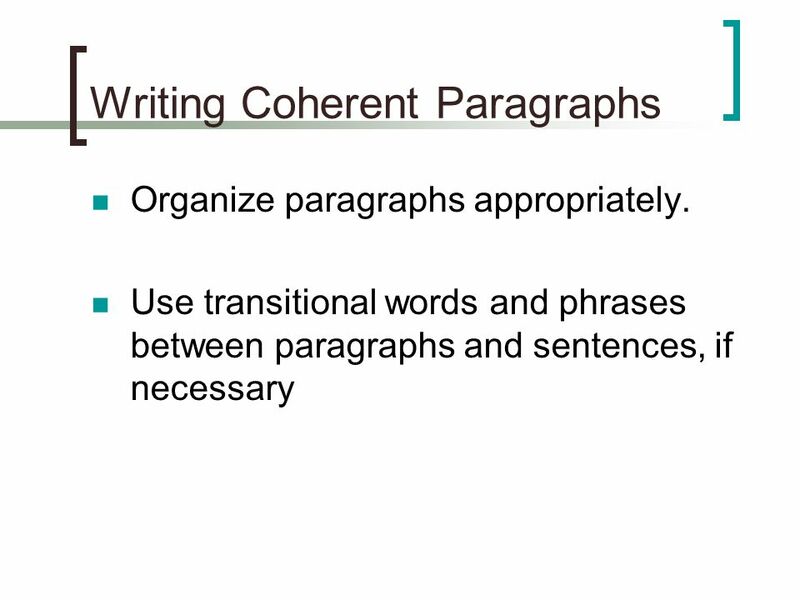 Or in some narrative or descriptive paragraphs an explicit topic sentence may seem forced or artificial. 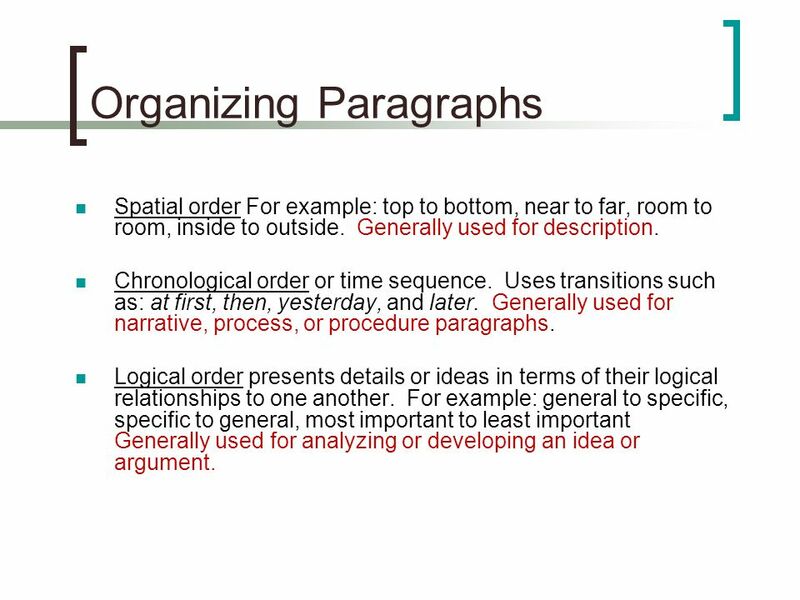 13 Organizing Paragraphs Spatial order For example: top to bottom, near to far, room to room, inside to outside. Generally used for description. Chronological order or time sequence. Uses transitions such as: at first, then, yesterday, and later. Generally used for narrative, process, or procedure paragraphs. Logical order presents details or ideas in terms of their logical relationships to one another. For example: general to specific, specific to general, most important to least important Generally used for analyzing or developing an idea or argument. 14 Paragraph Without Transitions Napoleon certainly made a change for the worse by leaving his small kingdom of Elba. He went back to Paris, and he abdicated for a second time. He fled to Rochefort in hope of escaping to America. He gave himself up to the English captain of the ship Bellerophon. He suggested that the Prince Regent grant him asylum, and he was refused. All he saw of England was the Devon coast and Plymouth Sound as he passed on to the remote island of St. Helena. He died on May 5, 1821, at the age of fifty-two. 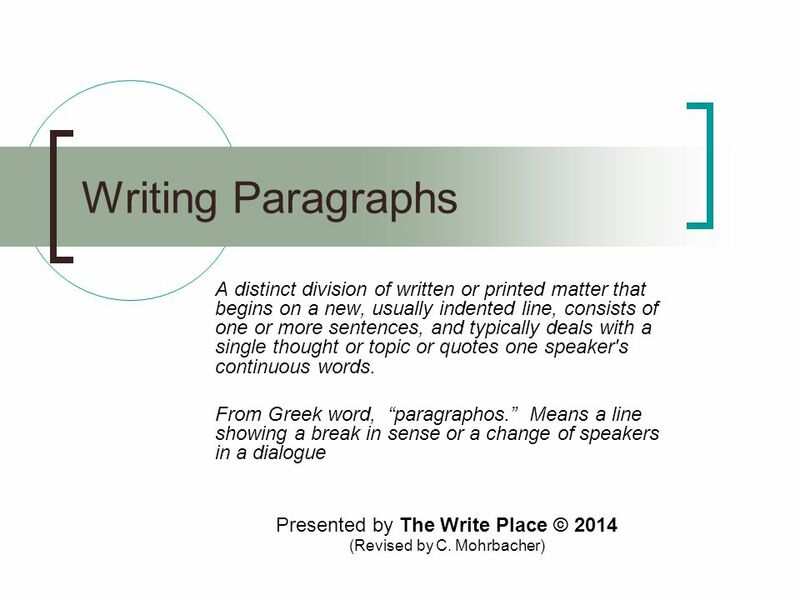 Download ppt "Writing Paragraphs A distinct division of written or printed matter that begins on a new, usually indented line, consists of one or more sentences, and." Academic Language & Transitions Words that make your writing strong! These words will help you with: Organization Connecting your thoughts Communicating. Words to Add, Compare, Contrast, Exemplify, Summarize, and Sequence. NARRATIVE 101 Tell a Story That Everyone Wants to Hear! 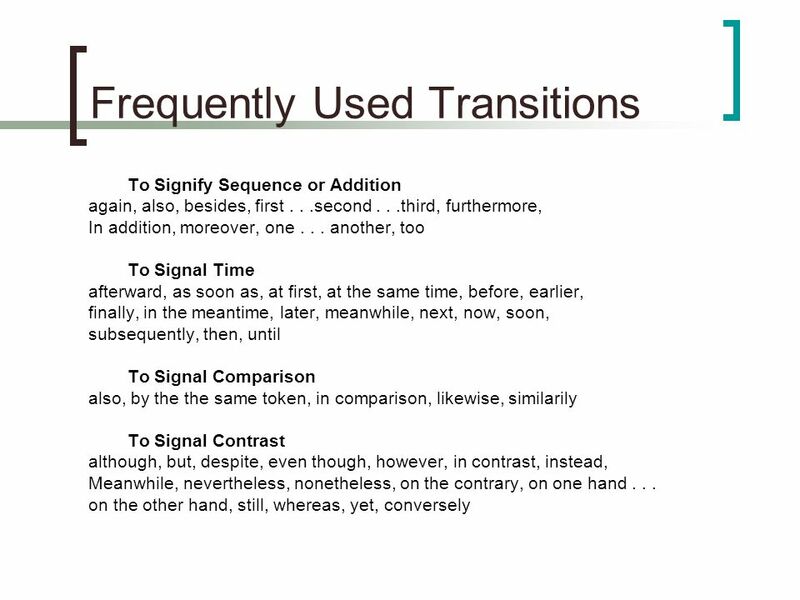 TRANSITIONAL MARKERS Compiled by Ms. Terri Yueh Formality Levels for transition Words and Expressions. Transitions Mrs. MacInnis ELA. Transitions  Using transitional words or phrases helps papers read more smoothly. They provide a logical organization.  Transitions link sentences and paragraphs together smoothly so there are no breaks between ideas. 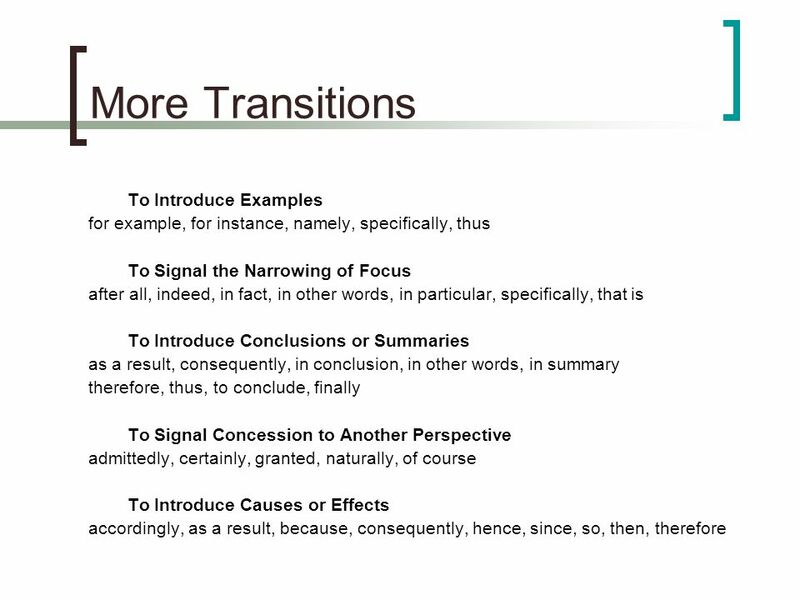 Use Transitions to Move Logically from Sentence to Sentence and from Paragraph to Paragraph Language Usage Skill # 18. CREED GREER UNIVERSITY WRITING PROGRAM DIAL CENTER FOR WRITTEN AND ORAL COMMUNICATION Writing in the Social Sciences Building Strong Paragraphs: Writing. The Writing Center Transitions Developed by: Joy Patterson. Useful Transition Words. Words that show location: Above Across Against Along Alongside Amid Among Around Behind Below Beneath Beyond Inside Into Near.